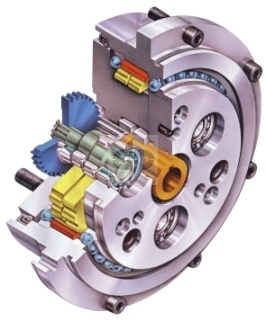 The RV-E Series gearhead by Nabtesco is a high-precision gearhead providing extreme precision and high performance in a very compact, ready-to-mount package. This series features a wide range of ratios (up to 185:1 by changing the first stage gear combinations) and high torsional rigidity. Vibrations are minimized by the patented two stage cycloidal reduction mechanism, prolonging equipment life. 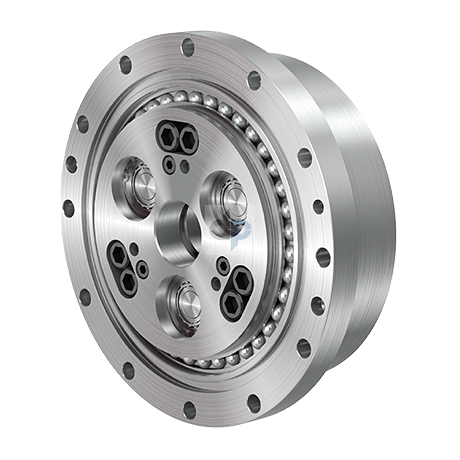 The gear teeth are in continuous contact with the cycloidal pin, resulting in a gearhead with very low backlash (less than 1 arc-min), low wear and long life expectancy, and the ability to handle high shock loads -- up to five times the rated torque for emergency stops. This reducer is supported on both ends by large angular bearings to provide large moment capacities, eliminating external support devices and simplifying installation.